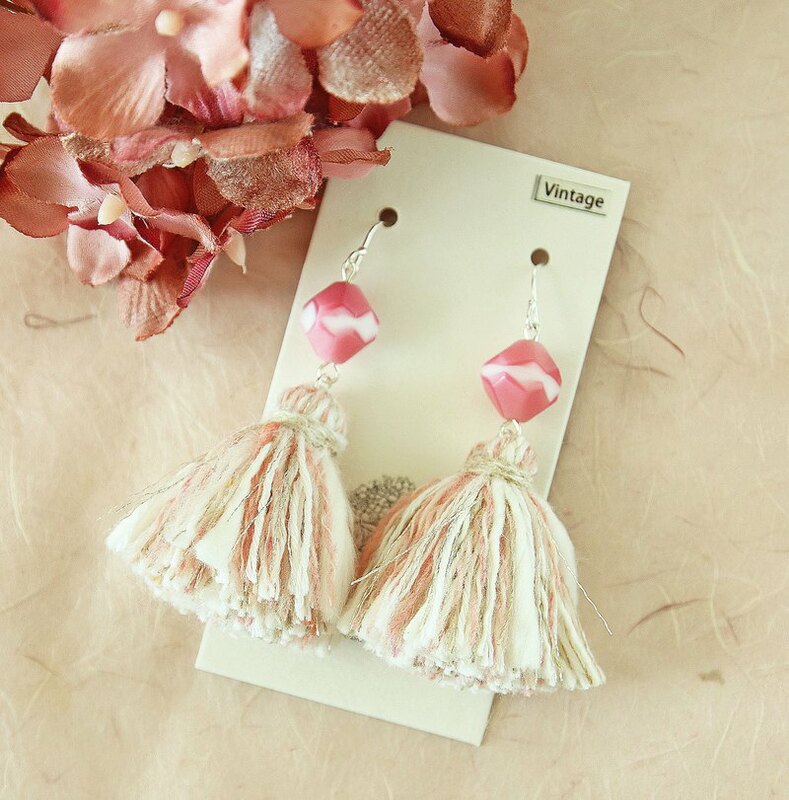 The retro glass beads of pink, white and pink are matched with the multi-colored tassels of Dust Pink, Milk and Silver, which are full of nostalgic and lovely taste. * Very limited edition vintage beads, absolutely not returnable. Like vintage style and slender things. The complex wire matching, carefully selected vintage beads with unique shape and beautiful color, is the focus of Aki's tassel earrings. Product desciption https://c2.staticflickr.com/2/1955/44281258235_02850d3982_b.jpg https://c2.staticflickr.com/2/1943/44281259005_70d898b038_b.jpg Vintage bead : Three-dimensional diamond beads (Germany), about 12mm, resin material, pink, white, pink three-color layer (color distribution ratio is different). * Very limited edition vintage beads, absolutely not returnable. Tassel: Set pink, milk white, light gray green, silver four colors, cotton wire (Japan), the wire is thick and uneven, add fun, about 3.5cm long. Size: Full length about 5.5cm (without ear hook) Material: Mianma wire, vintage glass beads Ear hook: 925 pure silver ear pin (can be changed ear clip) https://c2.staticflickr.com/2/1973/30046471047_c4eb97e091_n.jpg Replace anti-allergic ear hooks and ear clips (free) 1. Metal twisted ear clips for adjustable tension. 2. Metal crepe ear clips with resin pearls for adjustable tightness. 3. Resin ear hooks for girls who are sensitive to any metal ear hooks. *Please make a note in the remarks column. * Aki will use (1) unless otherwise noted. Japan anti-allergy, pain-reducing ear, ear clips and accessories (added goods), please go here to see: https://www.pinkoi.com/product/aLEpPzNc Remarks * Vintage beads refers to the beads that were manufactured 30-99 years ago, which have been discontinued, or traces of slight scratches and corners. They are also old-fashioned designs and materials, full of intoxicating nostalgia, unique and durable. the taste of, The vintage beads used by Aki are personally selected from Europe, the United States, and Japan. After cleaning and inspection, make sure there are no obvious scars. Please feel free to purchase. * vintage beads refers to the beads of the old age (old objects), not used, not used. * If the vintage bead is damaged during use, it will not be replaced. * Mind the vintage accessories, please consider carefully. *Vintage bead is extremely small and cannot be returned after the sale. The tassels can be re-made. After each vintage bead is sold out, it will be replaced with beads that can be lined with the same tassels. Please keep an eye out for updates. Postage Hong Kong It will take about 2-3 days to arrive by mail from Hongkong Post. * If you need to use the registered mail, please go to the link below to fill the postage. https://www.pinkoi.com/product/HFviLdQZ?category=99 Macau and Taiwan It will take about 4-10 days for delivery by Hongkong Post Airmail. Other countries It will take about 7-24 days to be sent by Hongkong Post Airmail. * For additional postal services, please contact Aki. * It is not responsible for damage or loss during delivery. * Generally, the order is subject to 7-21 days of delivery. If you need to advance or specify the date, please contact Aki. Maintenance of weaving works How to care the hand-crocheted works * Please remove the earrings when taking a bath. * Do not soak in sea water and pool water. * Please wear while keeping your hands clean to avoid sweat and stains. * Can be hand-washed, it is recommended to focus on cleaning, avoid soaking and pulling. * If it is wet with water during use, use a paper towel to dry it. * Please avoid being damaged by metal hooks, blades and other sharp objects. * Glass bead ornaments, please avoid strong collision, squeezing and scratching. * Avoid contact with perfumes, cosmetics and chemicals, and keep them in the air and sunlight for a long time to reduce fading. Tips Warm Reminder * A hand-made work cannot make exactly the same thing as a machine. Size, length or some slight difference, the thickness of the wire, the number of colors, the color distribution ratio can not be specified, this is the subtle unique features of hand-made, please understand, thank you. * The color and texture of the shooting light and the computer display may be slightly different from the actual one. If you have any questions, please contact me, because I hope you can enjoy the most beautiful material and handwork. * Some small accessories (eg buckle / ring...) If the goods are out of stock or need to be slightly adjusted, the designer will reserve the right to adjust without prior notice. * If you need to change the color, size, gadgets, etc., please tell me or check in advance when ordering, please do not make any changes after the production, please understand. * Thank you for admiring the woven ornaments.